This disc got a glowing review in American Record Guide both for sound and interpretation. I looked over the list of composers and only the Ginastera was in my collection (Naxos ). 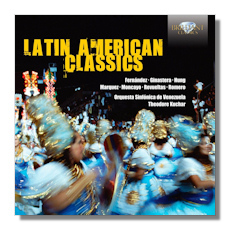 I do have recordings of music by Revueltas by Stokowski, among others but that's about it for Latin American composers. I hesitated when I saw who was conducting but given the orchestra was from Venezuela and the review and the price decided to give it a try. As I listened to the music the Duke's quote kept haunting me. I kept thinking that the interpretations were too much like a Kapellmeister. Rhythms seemed too four-square. So I pulled out the Naxos recording and, sure enough, that one passed the "toe-tapping test". At the same time I kept wondering if Eduardo Mata had recorded any of this stuff. I'd heard him do Chavez's symphonies with the London Symphony and was blown away with the Sinfonia India and suspected he might be the "cure" for the music. I checked and there was the Ginastera along with tons of other Hispanic music. That 6-CD set on Dorian 90914 is certainly everything that Kuchar lacks. The fact that the orchestra is the same one on the Brilliant disc clearly places the blame where it needs to be for the failure of that disc to have any swing. I thought of offering an extensive review of that set but the list of contents alone would dwarf the review. In addition to the Ginastera there is Villa-Lobos's Urapuru and Revueltas' Sensemaya (the only recordings I've heard that come close to Stokowski's) and the same composer's Redes. In addition you get Chavez's Sinfonia India and music by de Falls (okay, he's not Latin American, but hey!) to mention just a few. Add to all this the Dorian sound which is rich and transparent, basically audiophile. At a price of $5 a disc this set is a must for any serious collector of classical music. So, while I'm glad to have the many composers and their compositions available on the Brilliant CD I now keep wondering how it would sound with a better conductor.